The Marquis Bentley 39 offers a huge view at an economical price. Stop by today to design your Bentley! When the weather in Woodbury cools off, having a gas fireplace in a home is a great benefit. There is no wood to chop, no wood to buy, just a button to push for a gorgeous roaring fire that looks just like a wood fire. Ceramic, non-combustible logs display dancing flames that provide tremendous warmth. Besides the boon of not having to chop and carry in wood, there are several advantages to having a gas fireplace. Natural gas fireplaces are less costly to run than propane ones, but the following advantages apply to both types. A gas fireplace has a constant heat supply whereas a wood burning fireplace’s heat is dependent on how well logs burn, how long they burn, and how hot they burn. There are no ashes to clean with a gas burning fireplace. There are no sparks or embers that can fly out of a gas fireplace and burn the carpet or singe the wood floor. The masonry of the interior of the fireplace stays beautiful rather than getting blackened with creosote and burn marks. Gas fireplaces are good for a 25% savings on electrical or other heating costs. A gas fireplace is easier to start and stop, with no work to get a fire going, and no having to wait until the last embers burn out before safely leaving it. The air quality in a room is much safer for the room’s occupants with a gas fireplace than with a wood burning one because they is less particulate matter released into the air. Researcher Steffen Loft of the University of Copenhagen found that the particulate matter from wood smoke offer similar toxicity and negative effects on DNA to that of vehicular exhaust particles. Because the particulate matter is small enough to infiltrate deeply into the lungs, it can carry high levels of the chemicals in wood smoke into the body. These chemicals are linked to cancer, cardiopulmonary diseases, and can activate genes in harmful ways akin to the way cigarette smoke and car exhaust affect the human body. 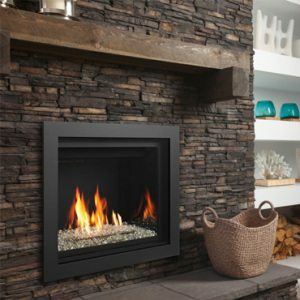 Gas fireplaces add value to a home, as they are perceived by homebuyers as being superior to, safer than, and healthier to be around then wood burning fireplaces. Gas fireplaces use a vent, so they need no chimney, thus they are easier and less costly to install in a home than a wood burning fireplace. Some gas fireplaces have a blower installed in them that helps circulate the air in a room and beyond into a house. Many gas fireplaces have a remote that allows users to turn on the fireplace from a distance. The remote also can be made inaccessible to children, adding to fireplace safety. Some area have banned wood burning fireplaces due to environmental concerns, but gas fireplaces have not been banned. Gas fireplaces have come a long way since they were first invented. Initially they had funny-looking logs with blue flames coming out of them. Now they are very realistic looking, with glowing orange embers and dancing flames that look just like a wood fire. Energy Savers has over a dozen on display in their Oakdale Minnesota showroom, stop by today and have one of our knowledgable sales representatives help find the perfect fit for you.